Remaining 2 bedroom apartment in prime top-end development, One Blackfriars, which is THE most talked about new tower in London with jaw-dropping views over the River, the City skyline and Canary Wharf. One Blackfriars is amongst some of the most iconic buildings in London, with its distinctive glass-front, affectionately called “The Vase”, it sits on the Southbank offering stunning river views of London. This new development of flats for sale in London’s Zone 1, By St George has been finished to an exceptional standard. Positioned in such a convenient location along the River with Blackfriars Tube and Overground train stations on your doorstep providing fast access to Bank station in under 15 minutes. 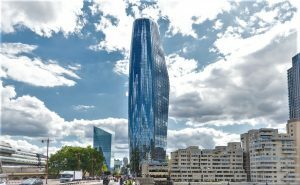 Demand for properties to rent at One Blackfriars is high from city corporate and many wealthy Chinese students whom are seeking luxury accommodation in a top location. If this property is of any interest, we advise you to get in contact quickly.